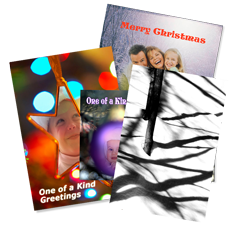 Cards are used as seasonal greeting, advertising, and special occasions. Personalize them with your favourite photo, create an art piece from your favourite work. Greeting cards are produced on heavyweight stock in a variety of paper types, textures and colours. Several standard sizes are available to fit most common envelopes or custom-sized and printed with or without a bleed. Cards can have an inside message or left blank. Personalization includes imprinting names from a database and custom messages. Matching envelopes available for some paper types and colours.